Churros are usually deep fried. 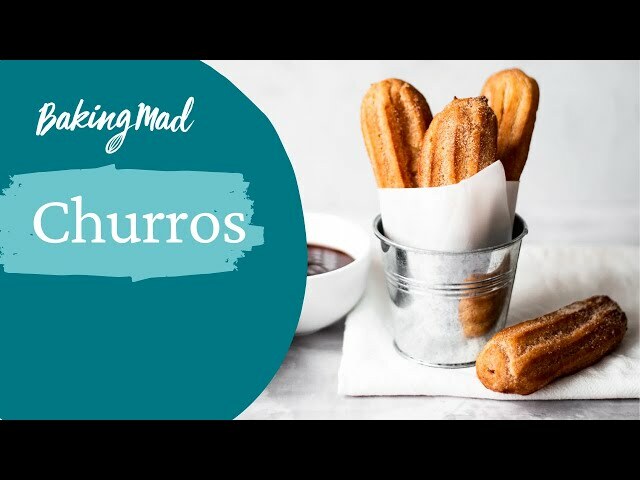 This recipe is for baked churros. We can all breathe a sign of relief! no extra oil added when it bakes in the oven. Treat your whole family to these delicious snacks. Choose your favourite dipping sauce too! Once baked, you can store them in an air tight container for up to 3 days. While the churros are baking make the dusting and place in a large freezer bag. Begin to make your chocolate sauce. Put all the ingredients in a pan and melt gently whilst stirring until you have a smooth shiny sauce. When the churros are ready, put them in the bag with the dusting and coat them well, then serve them straight away with the chocolate sauce (or sauce of your choice). These were lighter than the doughnut style deep fried ones. I made them in advance, piped them onto baking sheets and kept them in the fridge until needed which worked well. Yummy!